Leave a comment to guess. Then find out the answer here. The winner gets to admonish an Archbishop on the internet. I understand the modern age presents many of us with difficulties, but I expect these are not all entirely unique to this age and I would have thought an Archbishop might issue a rallying cry to fidelity to Jesus Christ and the Magisterium. It would appear not on this occasion. His Holiness Pope Francis despite some media splutters, is not swanning around advocating dissent (as can be read here). Despite his popularity with Bishops, I am not sure many Bishops understand His Holiness's vision. When was the last time you heard of a Bishop promoting the Divine Mercy Chaplet, the Holy Rosary and Confession within days of each other? There is a way to rouse the faithful out of complacency and it starts with Bishops teaching the Faith without 'but's. To be Christian in the modern age is extremely counter-cultural, we may even stumble along the way, but we are called to be faithful to Jesus Christ and His Church. Bishops should encourage us all to be faithful to Jesus Christ. ...'could do something else instead'. ... can reasonably hope that Hell is empty anyway, so why bother? ...apologise for Catholic teaching. Especially the "difficult" bits. 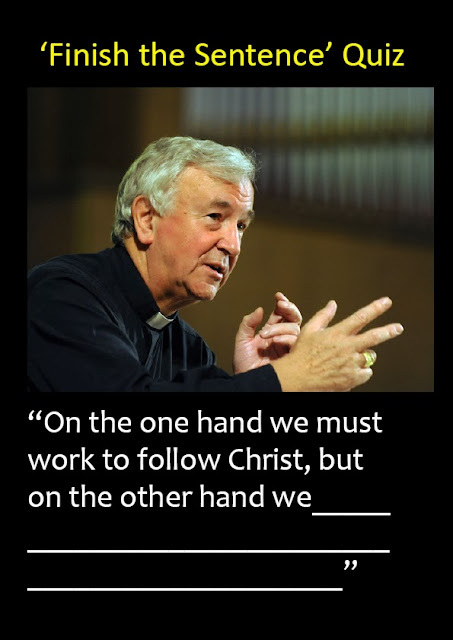 ....we could work to follow Christ." Oh, sorry. For a minute I thought the quote was from a Catholic Archbishop. "On the one hand we must work to follow Christ but on the other hand we must strive to bring others to follow Christ also"? Do I get the prize? On the one hand you are correct. On the other hand you are still correct. The Archbishop disagrees, but methinks he's wrong. You should get his archbishopric! Follow Christ, yes. because I really do want a red hat but then you have to be realistic on the other hand, we don't live in the Bronze Age after all and on the third hand you have to keep in with the Government and get with the programme. "On the one hand we must work to follow Christ but on the other hand we mustn't do anything which distinguishes us from non-Christians." "...we must not pretend that we have a monopoly of the truth and by doing so offend someone." On the other hand we could try for a red hat. ...Christ has to follow us'. must follow the ways of the world in order to fit in with this enlightened age as the protestants have done. Ummhh, Err, Err, Ummhh, Err, Ummhh, Err, Ummhh . . . Planet Earth! You Got Mail! Eureka! God Really is 'a Catholic God'!